A great place to shop for suits, matching outfits and ensembles! You will find something professional looking for the office or work. But also, lovely, vintage pieces which go well together and already match.Some cute, some professional, the ladies of past decades often wanted a well put together look. Skirts were paired with sweaters. Capris with a top or blouse. Dresses with little jackets. Everything all matching and done by the manufacturer. Sometimes, there are even more than 2 pieces to add to the fun.If that is what you are looking for, here is where you will find them at Angel Elegance Vintage. So, relax and enjoy your shopping and buying experience! 2 Piece There are 6 products. 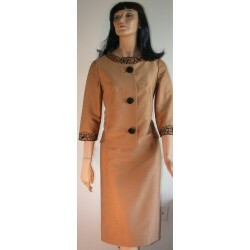 Great women's suit with a nice pencil skirt and short jacket or top. Designed by Raney's Fashions in Hong Kong. Nice, light brown coloring with black accents. Open cutwork, floral trim (about 1/2in.) circles the collar. More trim around the elbow length sleeves. This trim is embroidered onto the end of the sleeves rather than applied. Beautiful and romantic, this is a nice fashion set! Hand made crochet skirt and blouse - very open and lacy. Ecru color for a vintage look over any color slip or underslip you would like to wear with it. This long, floor length, formal gown comes with a bolero style jacket. The figure hugging bodice opens up to a full, skirt at the waist. Pleats in the skirt of this dress add lots of fullness and movement. Makes this gown a good choice for events with dancing and most any occasion where you would want to be able to move freely and with flow. Still has it's original tags from Bedell's. This tight fitting pencil dress comes with it's original short sleeve jacket which buttons up the back. Figure hugging style from the 1960's, it is vintage and retro. The cutwork embroidery design on the dress and jacket really make this outfit. Great for summer, office and career wear! Made from Zephyr chenille wool and french knit. Lacy open work around the neckline set off by sparkling rhinestones and light pink beadwork. Cream colored knit with a hint of silver threading. This skirt and sweater suit was made by French Knitwear Co., Inc. of New York and is a vintage piece. Original belt is included.